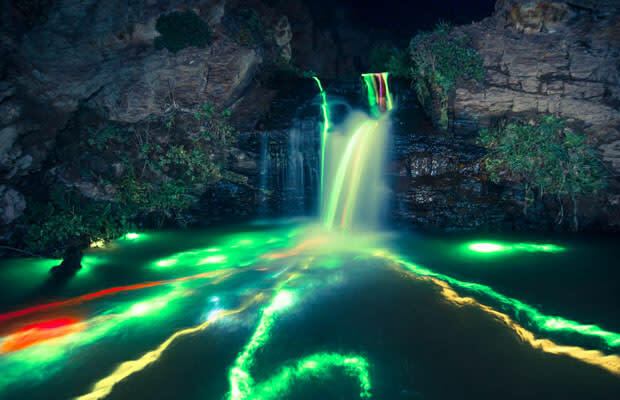 From The Lenz has produced a series of long exposure photographs using glow sticks and waterfalls. By dropping glow sticks into waterfalls, photographers Sean Lenz and Kristoffer Abildgaard have been able to capture the movement and trail of the lights as they traveled downstream. Neon Luminance was shot in locations in Northern California, using exposure times from 30 seconds to 7 minutes, and all glow sticks were retrieved directly after shooting. Who would have thought that the effect would be so surreal?